As I wandered along the trail on August 19th at Hamilton Pool Preserve, I noticed a small orange butterfly on a bedraggled leaf tip of a beargrass plant (which is in the genus Nolina). I thought it might be a least skipperling, Ancyloxypha numitor, but on September 14th Dan Hardy (thanks) of the Austin Butterfly Forum told me that this little butterfly is most likely an orange skipperling, Copaeodes aurantiacus. According to Stephen G. Williams, as mentioned by John Tveten in his book about butterflies of Houston, this is the most common skipperling in Austin. The two tiny “horns” on the butterfly’s face between its eyes are still puzzling. Awww, it’s so cute and fuzzy :). Great macro shot!! On both counts I’ll say it’s just like the photographer. Nature keeps calling, Jim, so there’s always something new to be en-theos-iastic about. “Got in the face” is a good way to put it. So the “horns” seem to be a regular feature, but I still wonder what purpose they serve. Maybe we’ll hear from a butterfly expert. That’s two “wow”s in a row, one in German and one in English. Wow! …hello there. This is ABC…amazing, beautiful and captivating. That makes three consecutive “wow”s, and you’ve added the first three letters of an alphabet that I’m only too willing to recite. Thanks. Great macro. It does look like a skipper, not that I’m an expert. I’ve had these pointed out to me by an expert. 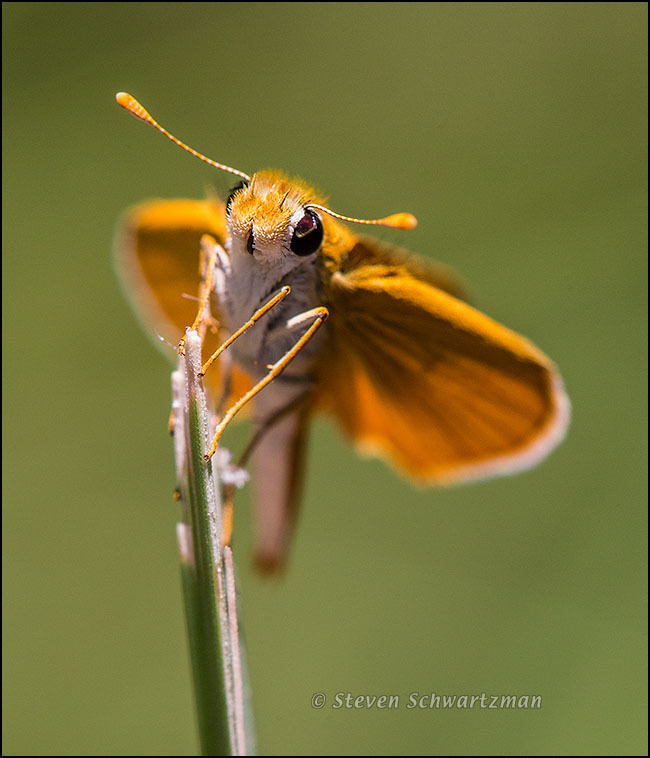 It’s definitely a skipper, Nora, but there are many species, and some of them that live in Austin look pretty similar to my untrained eyes. Not knowing what species this little butterfly is didn’t stop me from photographing it. Very, very nice. An insect portrait that looks different than most. Sweet one too! Thanks, Bente. The portrait does use a non-traditional pose, and that seems to be part of its appeal. The “Awwww” factor’s off the charts with this one. I’ve never seen a plush toy butterfly, but this one could be the model. It’s such a fine photo, and a terrifically appealing creature. It’s right up there with the standard for measuring such things – the green caterpillar! Similarly, I had the impression the butterfly’s face was made of a plush fabric, one that we can say is Awwwwf the charts. I’m glad I can provide occasional competition to the jolly green caterpillar. Spectacular shot Steve! My first thought was of an alien creature! Amazing details we get to see through the use of macro photography! Well, now that you mention it, insects are alien to us. Long live macro photography! This charmer is as winsome as his [probable] name! Great macro! Thanks, Kathryn. As I always say (except I’ve never said it till now): Winsome, lose some. That’s four wows (and counting). OK double WOW! Now that is 2 more…great work. If that’s a double WOW then I guess I’ll have to say thanks thanks. I find that a tripod impedes my freedom of movement too much with a subject like this one that’s already flitting about or likely to be. I steady myself and the camera as best I can by kneeling or sitting on the ground if possible and I typically use a shutter speed of 1/400 sec. or faster to limit movement of the subject and the camera. Thanks for your hypothesis that those structures are chemosensors. That certainly makes sense. Excellent image – love the angle of view. I may try the ID later, but skippers are tricky; you need dorsal and ventral views for good ID of some species. Agreed: the oblique angle accounts for part of this portrait’s appeal. As for identification of butterflies in general and skippers in particular, I often find it difficult, so I’m always grateful when people who know a lot more about such things help out. Merci, Sophie. C’est le soir chez vous, mais toujours l’après-midi ici. Bonne fin de journée alors😜. Je ne savais pas que tu parlais français. Je n avais pas encore lu ton about. Est ce que je peux t envoyer une photo de fleur en message privé pour que tu m’aides à trouver son nom? Je regrette, Sophie, mais si c’est une fleur hors de ma région texane, je ne la reconnaîtrai probablement pas. Mes connaissances botaniques sont assez limitées. Ok merci. En fait, c est une photo que j ai déjà publiée avec comme titre campanule mais je ne suis même pas sûre que cela en soit une. Merci d avance même si tu ne la reconnais pas. Thanks, Inga. All the elements conspired to make this portrait a success. It was so nice of the little guy/gal to pose for this photo. Remarkable to say the least! So nice indeed of this tiny skipper not to fly away before I could take a few pictures of it. Let’s see. Burnt orange, horns, what else could it be but a Texas Longhorn butterfly. Maybe a bit sad this week but eternally optimistic. Now that’s a highly localized and imaginative take on this little butterfly. I’ll have some more orange from my Hamilton Pool visit coming up in a few days. We’ll see if your imagination conjures up anything for that critter. Skippers are among the hardest of butterflies to identify I am told. I’m no expert either. However, I do know antennae when I see them. They are used to receive the XM Lepidopteran channel. 🙂 Pairodox Farm is correct…they are sensory organs and are used in different ways by different insects. Feel, smell, moisture and sounds are all detectable with the antennae. Last week I renewed my XM radio subscription but no one mentioned the Lepidopteran channel. Maybe it’s in a higher subscription tier. I have always though these guys were interesting. Great shot! Thanks, and I see that just a few days ago you showed a relative of the mistflower in the next post, Eupatoriadelphus purpureus. That’s another case where one genus name piggybacks on another: Eupatoriadelphus on Eupatorium. Une macro fascinante Steve, j’adore! That is just gorgeous, horns and all. I love the colours. It’s clear that for you the least skipperling is anything but the least appealing of the butterflies in Texas. Butterflies can be difficult, but this one worked out. And of a species I don’t believe I’d ever photographed till then. Call me a prophet, and one from whose prediction you’ve been able to profit. I suspect skippers are common in most places but may get overlooked because they’re small and not nearly as colorful as many of the larger butterflies. Your youth is returning. Love those antennae, horns, whatever they are! Went on a walk yesterday, photographing this and that, including some sort of dragonfly and some sort of butterfly, I thought, if Steve were here, he’d know the names of everything. There is one thing I made sure to identify when I got back home–that would be the bobcat I’d seen ahead of me on the path! I appreciate your vote of confidence, Susan, but my knowledge of nature is so limited, constrained to this little bit of central Texas. When I visited your part of the country last summer I felt like a stranger in a strange land, botanically, and when I did my guest posts of plants photographed there I had to scrounge for identifications. A bobcat is something I’ve never seen in the wild, so you’re ahead of me there. I understand exactly what you mean–I was totally flummoxed by the birds in England, scrounged for ID when I posted them, and still had to be corrected on several IDs!. The comparison I was really drawing as I walked had to do with what’s local for each of us, and in that regard, I appreciate what it takes to gain strong knowledge of even a small sector of the natural world, as you’ve done. I had my first encounter with Skippers not too long ago in Puerto Rico; great close-up! Thanks. I appreciate that, given that it comes from someone who does excellent macros herself. This butterfly’s “horns” are so tiny that I doubt many Texans would want to claim them, but I could be wrong. In any case, can’t-help-myself comments are always welcome. Magnificent! Your images are Fabulous! Y una foto muy popular. I just spotted this in your side panel, how lovely it is! I don’t think we have these butterflies here. There are probably some that I’ve not been aware of… I love the name of one of them ‘Dingy Skipper’!